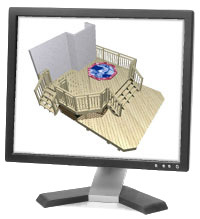 Revamp your customer’s outdoor living space with a custom deck designed through your 3D Deck estimating software. Let your customer choose the size, shape and color of the deck. Add levels, stairs and railings. Create, change and save as many deck plans as you need. With 3D Deck, not only can your customers see a complete 3D rendering of their envisioned deck, but you can also provide a complete estimate. Show your customers their exact deck before it’s built. They can see every deck shape, board, and piece of railing—in full 3D! Walk around the deck, zoom in close for a detailed perspective, zoom out to view the entire view, go underneath, or fly overtop. No more guessing what your customer wants. If the customer doesn’t like something, change it in seconds. Make all of your modifications as customers work with you to create their ultimate deck. Create the deck your customer wants, print out a 3D view of the deck and provide an estimate with a few clicks of some buttons. Designing a 3D Deck is extremely easy, but selling it is even easier. How can they not buy when you’ve given them exactly what they want? Seljax 3D Deck Estimating & Design software is a complete package that allows you to design decks in 3D and then calculate the estimate based directly from of the 3D drawing. The estimate calculation is done is seconds and has the dead-on accuracy of all Seljax Estimating software.